I began this project three years ago, back on February 16, 2009, and this is my 157th transcription. Since I began, many others have joined in on the meme. I am thrilled that this meme I started has inspired so many to transcribe their family history documents. Why do we transcribe? I provide my three reasons in the linked post. You may find others. I am going to use this milestone to take a break from my weekly transcriptions. It took awhile, but I am running out of things to transcribe and post. (I have no shortage of things to transcribe, but many aren't appropriate to post for one reason or another.) I also want to set aside some extra time in the week for last minute details that are bound to arise for an upcoming spring wedding, and summer honeymoon. I suspect I will come across documents that are appropriate for Amanuensis Monday, and when I do, I will post them, but it won't be every week. This week I transcribe a patent filed by my second great grandfather, Selig Feinstein and his business partner, Max Wieslman in 1898. I discovered this patent back in 2008, before I began this project. The text is stored in the patent database, with only minor OCR mistakes, but it's good to have a copy for my own records, and some family members may have started reading my blog since 2008. S. FEINSTEIN & M. WIESLMAN. SELIG FEINSTEIN AND MAX WIESLMAN, OF ST. LOUIS, MISSOURI. Be it known that we, SELIG FEINSTEIN and MAX WIESLMAN, citizens of the United States, residing at St. Louis, in the State of Missouri, have invented certain new and useful Improvements in Hydrants, of which the following is a full, clear, and exact description, reference being had to the accompanying drawings, forming a part hereof. Our invention relates to improvements in hydrants; and it consists in the novel combination and arrangement of parts, as hereinafter more fully described in the specification and pointed out in the claim. In the drawings, Figure 1 is a combined section and side elevation of our complete invention. Fig. 2 is a top plan view of the same. Fig. 3 is a top plan view of the valve-lever; and Fig. 4 is a cross-section of the screw-bearing, taken on the line x x of Fig. 1. 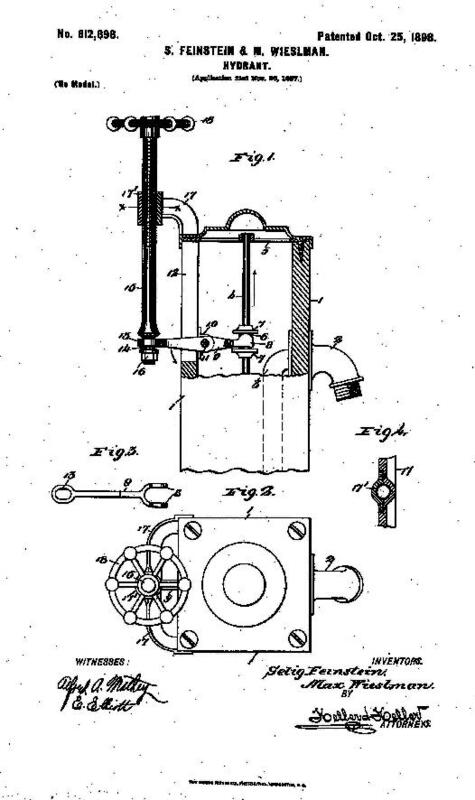 The object of our invention is to apply suitable screw-operating mechanism to the ordinary hydrant, whereby the flow of water can be thoroughly regulated, and, further, cannot get out of order or broken, as is commonly the case where a lever is employed for raising and lowering the valve-stem of the hydrant. 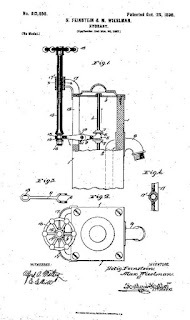 Briefly stated, the invention consists of the ordinary valve-stem, which is adapted to be raised for allowing the water to flow from the spout of the hydrant, a lever pivoted to the casing or boxing of the hydrant, one end of which is in movable connection with said valve-stem, a bracket rigidly secured to said casing and having a central screw-threaded bearing, and a screw-threaded rod passing through said bearing and having a hand-wheel secured to its upper end for turning said screw-threaded rod within its bearing in either direction for raising and lowering the same, the lower end of the rod being movably connected to the outer or opposite end of the said lever. Referring to the drawings, 1 represents the casing or boxing of the hydrant; 2, the spout for the same, which is in communication with the water-supply pipe 3, and 4 the valve stem or rod, the upper end of which is received and guided by a spider 5, all of which are of the usual construction and may be found in any hydrant. Located at a suitable distance from the upper end of the valve-stem and embracing the same and secured thereto is a collar 6, having upper and lower flanges 7, with which loosely cooperates the forked inner end 8 of the lever 9. The lever 9 is pivoted intermediate of its ends to an ear 10 by a pivot-bolt 11, said ear being secured to the inside of the boxing 1, to one side and adjacent to the vertical slot 12, formed therein. The outer or opposite end of the lever 9 is provided with an elongated opening 13, which receives loosely the reduced lower end 14 of the screw-threaded rod 15, a nut 16 being screwed on the lower end of the reduced portion of the said rod for holding the lever 9 in movable connection therewith. 17 represents a bracket which is rigidly secured to the boxing 1 of the hydrant and is provided with a central sectional screw-threaded bearing 17', which receives the screw-threaded rod 15, the upper end of the said rod having secured thereto a hand-wheel 18, whereby upon the turning of the said rod in one direction the outer end of the lever 9 is depressed, causing the inner end of the same to be raised, and consequently raise the valve-stem 4, permitting the water to flow, according to the amount desired. 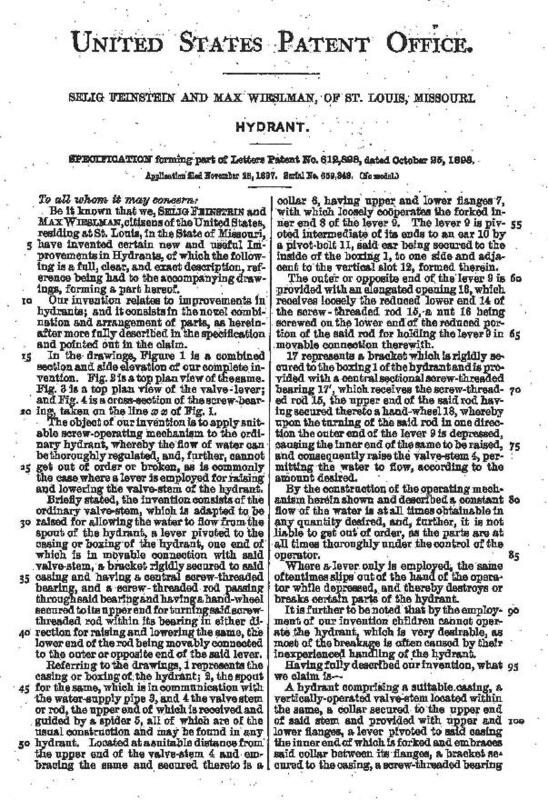 By the construction of the operating mechanism herein shown and described a constant flow of the water is at all times obtainable in any quantity desired, and, further, it is not liable to get out of order, as the parts are at all times thoroughly under the control of the operator. Where a lever only is employed, the same oftentimes slips out of the hand of the operator while depressed, and thereby destroys or breaks certain parts of the hydrant. 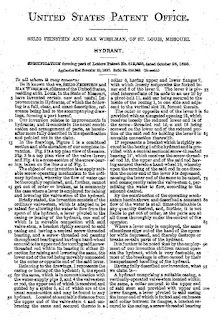 It is further to be noted that by the employment of our invention children cannot operate the hydrant, which is very desirable, as most of the breakage is often caused by their inexperienced handling of the hydrant. A hydrant comprising a suitable casing, a vertically-operated valve-stem located within the same, a collar secured to the upper end of said stem and provided with upper and lower flanges, a lever pivoted to said casing the inner end of which is forked and embraces said collar between its flanges, a bracket secured to the casing, a screw-threaded bearing forming a part of the same, and an elongated opening formed in the opposite or outer end of the lever, a screw-threaded rod passing through said screw-threaded bearing, a hand wheel secured to the upper end of the same the lower end of said screw-threaded rod being reduced forming a shoulder which is in contact with the said lever and its reduced portion received by the said elongated opening in the lever, and a nut screwed on the lower end of said reduced portion below the lever whereby a movable connection is formed between said lever and rod, substantially as described. In testimony whereof we affix our signatures in presence of two witnesses. Witnesses: ALFRED A. MATHEY, C. F. KELLER. 2) It appears neither Selig nor Max signed their name under Inventors, but someone else signed for them, and their lawyers attested to the signature. If neither Selig nor Max could sign their names, it raises the question who wrote the application. I suspect they explained their invention to someone, possibly the lawyers, who then filled out the application. 3) There are two signatures for witnesses underneath the image, and two witnesses listed at the end of the application. Only one signature matches. It seems the second witness is different in both places.